Ramsey Qubein explores the buzzing capital of Mozambique and finds exotic markets, colonial architecture and macabre museums. 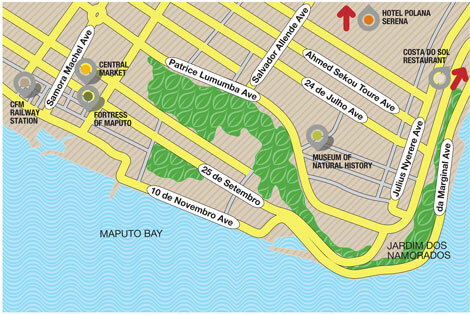 Maputo, the growing port city and capital of Mozambique, is rising out of its 1977-1992 civil war destruction to become a vibrant and lively urban centre. Its Portuguese heritage lends a European feel to an otherwise industrial city and, a few years ago, it launched a multimillion-pound urban regeneration campaign called “Promaputo” to transform it into a modern, southern African hub. A good place to start is the museum inside the 18th-century Fortress of Maputo (Nossa Senhora da Conceicao, near the Fishing Harbour), as it lays the groundwork for the country’s colonial past and protection of its coastline from passing pirates. The fortress is one of the oldest structures in the city, resembling the style of many of the Portuguese defence outposts along Eastern Africa. Today, it houses a collection of military memorabilia including statues and weaponry that tell of the history and independence (which was won in the mid 1970s) of this former Portuguese colony. Open Mon-Sun 9am to 12pm. Entry is free. In the heart of bustling Maputo, only a few blocks away from the fortress, this magnificent architectural gem is worth a look no matter how hectic your schedule. The entrance immediately takes you back in time with its marble pillars and wrought-iron roof. Off the tracks, two original steam locomotives sit by idly, acting as a reminder of the days when they transported people around the region. The railways were heavily damaged during the civil war and, nowadays, only trains to Johannesburg operate regularly as well as a few to the Zimbabwean border. Be sure to walk the length of the tracks to find the beautiful Kampfumo café, filled with photos of how the station used to look. Make your way to the hot and manic Central Market (Mercado Municipal, Avenida 25 de Setembro), where trade should be in full swing – it’s only a short walk from the CFM station. Open daily as the primary hub for fresh produce, and located beneath the iron roof of a neoclassical building, visitors co-mingle with locals as they purchase vegetables, cashew nuts and seafood. Watch how those in the know haggle for their daily groceries, and witness fishermen display their freshly caught prizes. Crafts and souvenirs can be found here, but the Saturday market at Praca 25 de Junho (by the fortress) and the daily Feima food and craft market at Parque dos Continuadores offer a wider spectrum of choices. The fashion-focused should head across the street from Central Market to Casa Elefante, a shop with the biggest and best selection of bargain-priced, imported African fabrics such that used for capulana, which are like sarongs and commonly worn by Mozambicans as a skirt or dress. If the food at the market is making you hungry, take a cab to Costa do Sol restaurant. Renowned as a city favourite by expats and locals alike, this family-owned seafront restaurant along Avenida da Marginal (number 10,249) is a good place to stop for a bite. Its art deco style and extensive menu of fresh fish caught daily, as well as local specialities, make for a perfect afternoon of lingering in the sun. Try the peri peri prawns washed down with national lager 2M (pronounced “dosh em”) or Laurentina Clara, which is now exported to South Africa. Indoor seating is available but the outdoor terrace facing the expansive beach in front is the best place to pause for some nosh. A short drive away by taxi is this fascinating museum of natural history in a colonial building near Hotel Cardoso. Get up close and personal with large stuffed animals or examine the display of preserved elephant foetuses. Indigenous insects, birds and fish all appear in glass cases, and an enormous shark collection makes you think twice before venturing into the sea. The variety of African tribal masks and pottery is especially interesting for those wishing to know more about the rural culture of the area. 104 Praca Travessia do Zambezi. Open 8.30am to 3.30pm Tues-Fri, 10am-5pm Sat-Sun. Closed Mondays. Entry is MTn 50 (£1.20).